Kevin James Mawae (/məˈwaɪ/; born January 23, 1971) is a former American football center who played in the National Football League (NFL) for sixteen seasons. He played college football for Louisiana State University (LSU), where he was a four-year starter. He was picked by the Seattle Seahawks in the 1994 NFL Draft, and also played for the New York Jets and Tennessee Titans. Mawae was selected for the Pro Bowl on six consecutive occasions (1999–2004), and was a seven-time All-Pro. He also served two terms as NFLPA president, which coincided with the 2011 NFL lockout. A military brat, Mawae grew up wherever his father, Sgt. 1st Class David Mawae, was stationed. Born in Savannah, Georgia, while his father served at Hunter Army Airfield, he spent three years of his childhood (ages 5–7) in Fort Riley, Kansas, and then five years (ages 8–12) in Hanau, Germany when his father was stationed at Fliegerhorst Army Airfield. It was in Hanau where Mawae began playing football. His father then was deployed to Fort Polk, near Leesville, Louisiana. Mawae attended Leesville High School, where he was an all-state football selection and earned all-academic honors. Mawae attended Louisiana State University, where he played for the LSU Tigers football team from 1989 to 1993. He was redshirted in 1989. He started seven games at left tackle and was a freshman All-SEC selection in 1990, and also was the Tigers' long snapper. After his sophomore season, he was a first-team All-SEC selection, having played three different positions: left tackle (8 games), center (3 games), and left guard (1 game). As a junior, he played left tackle and was chosen second-team All-SEC and was a third-team All-American. For his senior season he moved from left tackle to center for all 11 games. He played in the Blue-Gray Game and Senior Bowl after his senior season. Mawae was inducted into the LSU Athletic Hall of Fame in 2007. Mawae was originally drafted by the Seattle Seahawks in the second round (36th overall) of the 1994 NFL Draft. He was Louisiana State's highest selected offensive lineman since Bo Strange in 1961. Mawae saw his first pro action at right guard against the Oakland Raiders on September 11, and never left the lineup after taking over early in the game versus the Indianapolis Colts. He finished the season playing in 14 games, starting the final 11 at right guard. After the season Mawae earned first-team All-Rookie honors from Pro Football Weekly/Pro Football Writers Association, College and Pro Football Newsweekly and Football News. In 1995 he started all 16 games at right guard, seeing time at center in two games. He was moved to the center position at the start of his 1996 season and remained at that spot for the rest of his NFL career. In 1998, Mawae was signed by the New York Jets. In his first season in New York, the Jets' offense averaged 357.2 yards per game (second-best in AFC and fourth-best in NFL), while controlling the ball for an average of 32:17 minutes per game (second-best in AFC and third-best in NFL), also helped running back Curtis Martin to rush for franchise-record eight 100-yard rushing games en route to 1,287-yard season. He started all 16 games. In 1999, he was named to his first Pro Bowl on December 22, he did not miss a play for the second straight season and paved the way for Martin's then franchise-record of 1,464 yards rushing, and snapped to four different quarterbacks; Vinny Testaverde, Chad Pennington, Rick Mirer and Ray Lucas. During the 2000 NFL season, he was member of the line that tied Indianapolis Colts for fewest sacks allowed during regular season with 20. Also helped Jets offense average 337.2 yards per game was the 12th best in NFL and the passing offense averaged 245.3 yards per game (sixth in NFL). Mawae earned his second consecutive starting spot as AFC team Pro Bowl center he was selected to the Pro Bowl on six consecutive occasions (1999–2004). In 2002, he underwent offseason shoulder surgery to repair damage to left rotator cuff, he missed two preseason games but kept his consecutive games started streak by making 124th consecutive start in season opener against the Buffalo Bills. His unbroken streak of 177 games came to an end in October 2005 with a serious triceps injury to his left arm, and he missed the rest of the season. On March 5, 2006, he was cut by the Jets. 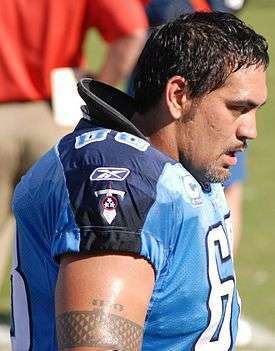 After being cut by the Jets, Mawae was signed by the Tennessee Titans nine days later on March 14, 2006. In his first season with Tennessee, he helped the offense rank third in the AFC and fifth in the NFL in rushing with 2,214 yards. The Titans set a franchise record by averaging 4.7 yards per carry, and the offensive line, led by Mawae, finished tied for 10th in the league with only 29 sacks allowed, Titans running back Travis Henry finished 2006 with 1,211 rushing yards and rookie quarterback Vince Young was named AP Offensive Rookie of the Year. In 2007, Mawae was voted team captain and started 14 games, helping LenDale White register his first career 1,000-yard season as he finished with 1,110. In 2009, Mawae was ranked fifth in a Sports Illustrated poll of "dirty players". The magazine surveyed 296 NFL players to come up with the ranking. Mawae was quoted on the Titans' site as saying he was "proud" of the recognition because he plays the game hard, but conceded, "I’ve been known to leg whip a time or two. I've paid the price for those, both physically and in the pocket." On September 10, 2010, Mawae announced that he was retiring from the NFL after 16 years in the league. His last game was the 2010 Pro Bowl. Kevin Mawae joined the NFLPA's executive committee in 2002, was elected its president in March 2008, and was re-elected in 2010. In September 2010, Mawae announced his retirement from the NFL, however he continued to serve as president until the end of his term in March 2012. Mawae's term coincided with the death of longtime NFLPA executive director Gene Upshaw, and the 2011 NFL lockout, which Mawae has stated he believes hastened the end of his playing career. During the NFL kickoff game broadcast in 2010, players from the New Orleans Saints and Minnesota Vikings "raised an index finger" as they took the field, a gesture Mawae has called "one of the proudest moments I ever had". According to Mawae, it was under his presidency that active players were present for negotiations of the collective bargaining agreement. He has also served as an assistant coach in the annual NFLPA Collegiate Bowl. Mawae is of Hawaiian descent. Mawae is married to Tracy Dale Hicks, he proposed to her in the summer of 1992 at LSU Fan Day in front of 140 teammates, 10 coaches and 3,000 fans over the public address system, the couple has a son, Kirkland (born 1997), and a daughter, Abigail (born 2000). The Mawae's were residing in Franklin, Tennessee, until selling the property in 2012. Kevin and his family have since settled back in their home in Baton Rouge, Louisiana. A few years into his NFL career, Mawae lost his brother, John, in a car accident. John, a former nose guard at LSU, left a profound effect on Kevin by establishing a strong faith prior to his death. Mawae's tragic loss has allowed him to develop a strong Christian faith. During the 2008 offseason, Mawae and his family spent two weeks in Africa with Children’s Cup International Relief, a missions organization that the Mawae family has helped support financially. They traveled primarily in Swaziland, Mozambique, Zambia and Tanzania. He was Eddie Towne's favorite player in ESPN's hit show TILT. He created the First and Goal Challenge, a unique program to benefit Winthrop-University Hospital's outstanding Child Life Program and Pediatric Services. ↑ "Former NFL greats host Fort Polk youth football skills clinic, show support for hiring veterans". Fort Polk Guardian. November 30, 2012. 1 2 Partsch III, Raymond A. (January 14, 2013). "Hard lesson learned: Brother's death sets former Leesville High star on special path". Daily Town Talk. Retrieved April 2, 2013. 1 2 Saraceno, Jon (October 21, 2010). "Mawae's labor of love: Fighting for players; President of union braces for NFL's bargaining battle". Retrieved April 1, 2013. ↑ Walker, Theresa M. (September 10, 2010). "Mawae, NFLPA president, to retire after 16 seasons". The Washington Times. Associated Press. Retrieved April 2, 2013. ↑ Maske, Mark (February 2, 2012). "Super Bowl 2012: Players union, NFL still talking about HGH blood tests". The Washington Post. Retrieved April 2, 2013. ↑ Mullen, Liz (March 15, 2010). "Kevin Mawae Elected To Second Term As NFLPA President". Retrieved 2 April 2013. ↑ "Kats' Diller to play in NFLPA all-star game later this month". The Huntsville Item. January 8, 2013. Retrieved April 2, 2013.